You’ve probably played Scrabble, but have you tried sCREEble? That’s Scrabble with a Cree language twist – and it’s just one of the ways U of T students are encouraging people to learn Indigenous languages in a fun – and mostly low-pressure –environment. 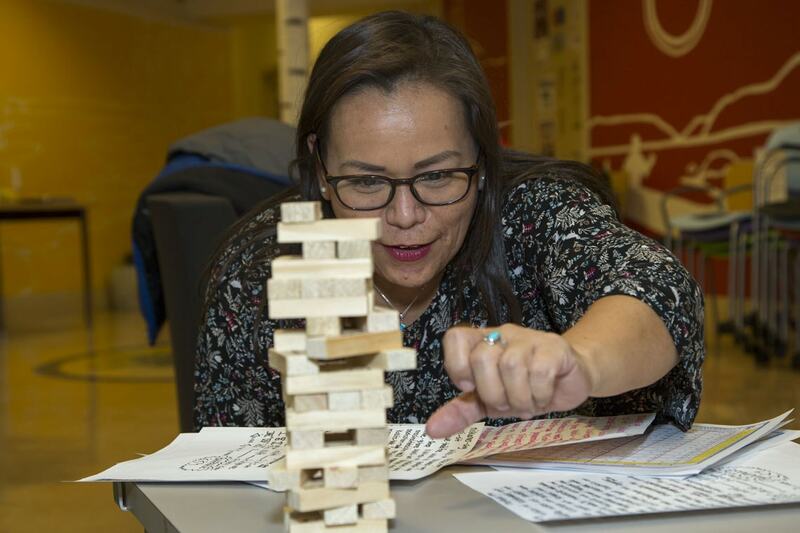 Ciimaan/Kahuwe’yá/Qajaq hosted its first-ever Indigenous Language Games last week. Taking over the Turtle Lounge in U of T's First Nations House, the group offered a rousing game called Baapaase, which could best be described as a mash-up of Jenga and charades. Within minutes, strangers who had gathered for the games were up and out of their seats, acting out charades for one another. “Pootawe” (build fire) pantomimed one player in Anishinaabemowin, sparking an invisible match onto the flame. Another man acted out “Shikatentam” (lonely). Connor Pion, a U of T alumni who teaches Anishinaabemowin, the language of the Anishinaabe peoples, etched words into blocks to create his own version of Jenga. One one side he fire-etched the Jenga-like blocks with Anishinaabemowin, and on the other side the English translation. His game, Baapaase, means woodpecker in Anishinaabemowin. “The game is called woodpecker because you have to tap out the game pieces like a woodpecker,” said Jenny Blackbird, coordinator of the student group which organized the event. Players had to remove a block from the middle of a teetering tower, find its meaning on a legend and act out the word or phrase for others to guess. That sparked discussion among the players about dialect and meanings. Pion learned to speak and teach Anishinaabeemowin in U of T’s Aboriginal Studies program. At the end of the game, Pion showed participants how to sound out the words phonetically and spell them in syllabics with the help of a handy colour-coded consonant, vowel and syllabics chart. “Let’s break it up into sounds,” said Pion, as he demonstrated by scrawling a word on a giant flip chart. “Every community should have Indigenous Language games night,” she said. The Indigenous Language Games are free and open to the public. The next one is Cree Language Bingo, from 5:30 p.m. to 7:30 p.m. on Feb. 8. Participants will learn how to count in Mushkego Cree with Stella Walker, a multidisciplinary artist, producer and comedian who has studied Cree in Vancouver, Saskatoon and the Native Canadian Centre of Toronto.